USA - AZ, tel. +1 480-961-1382 • EUROPE - BELGIUM, tel. +32 9 235 3611 www.rogerscorp.com Rogers RO4835T spread-glass-reinforced, ceramic-filled laminates are low-loss materials in 2.5, 3.0, and 4.0 mil thicknesses. They are well suited for millimeter-wave frequencies as part of the inner cores of 5G hybrid multilayer PCBs. They can work with other materials to provide the many functions needed by 5G wireless base stations, including power, signal control and signal transfers. Rogers RO4450T bonding materials are available in 3, 4, and 5 mil thicknesses to help construct those 5G hybrid multilayer circuits. These spread-glass-reinforced, ceramic-filled bonding materials complement the different materials that will form these hybrid circuits, including RO4835T and RO4000® laminates. And for many 5G hybrid multilayer circuits, Rogers CU4000™ and CU4000 LoPro® foils will provide a suitable finishing touch for many hybrid multilayer circuit foil lamination designs. 5G is coming! Do you have the right circuit materials? Learn more at www.rogerscorp.com/5G Frequencies at 28 GHz and higher will soon be used in Fifth Generation (5G) wireless communications networks. 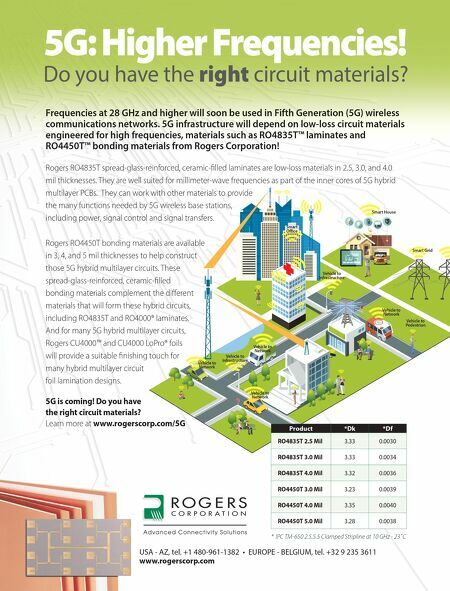 5G infrastructure will depend on low-loss circuit materials engineered for high frequencies, materials such as RO4835T™ laminates and RO4450T™ bonding materials from Rogers Corporation! Smart Grid Smart House Smart Office Vehicle to Infrastructure Vehicle to Network Vehicle to Network Vehicle to Network Vehicle to Network Vehicle to Infrastructure Vehicle to Pedestrian Product *Dk *Df RO4835T 2.5 Mil 3.33 0.0030 RO4835T 3.0 Mil 3.33 0.0034 RO4835T 4.0 Mil 3.32 0.0036 RO4450T 3.0 Mil 3.23 0.0039 RO4450T 4.0 Mil 3.35 0.0040 RO4450T 5.0 Mil 3.28 0.0038 * IPC TM-650 2.5.5.5 Clamped Stripline at 10 GHz - 23˚C 5G: Higher Frequencies! Do you have the right circuit materials?